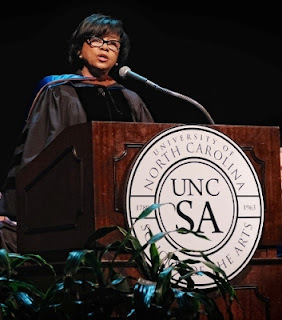 WINSTON-SALEM, N.C., May 14, 2015 /Cheryl Boone Isaacs, president of the Academy of Motion Picture Arts and Sciences (AMPAS), told graduates of the University of North Carolina School of the Arts (UNCSA) during her commencement address on May 9 at the Stevens Center in downtown Winston-Salem. "As the world becomes smaller and more globally connected, you as artists have a responsibility to protect freedom of expression and ensure that no one's voice is silenced by threats, violence or prejudice, and that different opinions can be shared without fear of personal or professional attack," she said. Boone Isaacs is serving her second term as president of the 7,000-member Academy, presenter of the Oscars. "Every year at the Oscars we honor the courage of filmmakers who cross borders and test boundaries, who give voice to challenging ideas and alternative points of view, and who encourage us to see the world and those around us in new ways," she said. "As you embark on the next phase of your careers in the arts, I hope you will carry that torch, tell the truth about the world as you perceive it and change the narrative." Boone Isaacs told 235 recipients of bachelor of fine arts, bachelor of music, master of fine arts and master of music degrees they should remain faithful to their aspirations: "I want you all to follow your passion. There may be detours … but just keep moving forward. Stay focused on your goals and dreams. Happiness is a goal of life." She noted that "there will be times when your passion has to take a back seat to the need to earn money. A career in the arts does not guarantee financial stability, but if you're smart about finding ways to monetize the work you love, the rewards will be immense." As head of CBI Enterprises, Inc., Boone Isaacs has consulted on marketing efforts on such films as THE CALL, THE ARTIST, THE KING'S SPEECH, PRECIOUS: BASED on the NOVEL "PUSH" BY SAPPHIRE, SPIDER-MAN 2 and TUPAC: RESURRECTION. Previously, she oversaw marketing for New Line Cinema's box office hits including AUSTIN POWERS: THE SPY WHO SHAGGED ME and RUSH HOUR; and for Paramount Pictures she orchestrated publicity campaigns for the Best Picture winners FORREST GUMP and BRAVEHEART. "As a marketing and public relations executive both at major studios and independent companies, I have had to learn to maneuver both sides of the show business equation – the show side and the business side," she said. "As creative artists nowadays, it's incumbent on you to understand the business of the arts." Boone Isaacs told the graduates their conservatory education will serve them well. "It's hard to see it now, but your time here will fundamentally shape the way you look at the world, solve problems and challenges, and build a sustainable future," she said. Technological advancements offer countless opportunities to this generation of graduates, she said, but technology has not altered "the human love of storytelling – whether it is music, painting, literature, dance or film." She also asked the graduates to "give back to the community through the nonprofit sector. There are so many youngsters who never get the chance to experience the arts. I urge you to support arts education for the underserved." In closing, Boone Isaacs advised graduates to "bring the light of humanity and inspiration that you found here at UNC School of the Arts to the world around you." Presiding over his first UNCSA commencement, Chancellor Lindsay Bierman spoke of mixed emotions. "I've loved seeing your work in our shops and studios, and on our stages and screens. But I'm personally very, very sad to see you go," he said. "Wherever you go from here, I want you to know this: I will always admire your creativity, respect your individuality, and applaud your extraordinary talents. The past two semesters together have made me one of your biggest lifelong fans." Wearing custom-designed academic regalia created by UNCSA costume design faculty and students, Bierman asked graduates to recall the moment they informed their parents of their career choice. "Parents, let's be honest. Some of you took the news pretty hard at first," he said. "You might have hoped for finance, or engineering. "But you knew, in your heart, that your child has a rare ability and passion that must be cultivated and nurtured and protected. That success is defined by doing what you love, and loving what you do. That your child's unique gift, discipline, and focus would be highly valued and developed at a conservatory. That being true to oneself, and following one's calling, can lead to the richest and most rewarding life of all." Honorary doctorates were presented during the ceremony to Boone Isaacs and to Dean Emeritus John Sneden, who led the School of Design and Production from 1970 to 2003 and established the first graduate program at the School of the Arts.